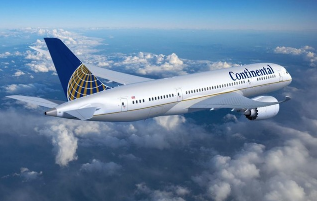 Continental Airlines is based in Houston, Texas with secondary hubs at Newark Liberty International Airport and Cleveland�s Hopkins International Airport. Continental�s extensive network includes services to domestic and international destinations in the US, Canada, Europe, Asia Pacific, Central and South America. Formerly in the SkyTeam alliance, Continental became a member of the Star Alliance in late 2009 and is merging with United Airlines. By Capa Aviation. ALAMEDA, Calif. Voxify, the first company to create Automated Agents(TM) for call centers with the conversational skills to handle advanced customer service calls, today announced that Continental Airlines (NYSE: CAL) is successfully using Voxify's Automated Agents to manage flight reconfirmation calls and deliver excellent customer service. A leader in customer service, Continental chose Voxify for their breakthrough technology and ability to deliver automated systems with superior customer experience, rapidly and cost-effectively. Continental estimates that approximately 10% of incoming customer calls involve flight reconfirmation. HOUSTON: Continental Airlines today reported an all-time record systemwide mainline load factor of 84.5 percent for July 2003, 5.0 points above last year's July load factor and 3.5 points above the previous record set in June 2003. In July 2003, the airline had an all-time record domestic mainline load factor of 85.7 percent, 6.5 points above July 2002 and 3.9 points above the previous record set in June 2003, and an international mainline load factor of 82.5 percent, 2.6 points above July 2002. During the month, Continental recorded a U.S. Department of Transportation on-time arrival rate of 80.4 percent and a systemwide completion factor of 99.8 percent for its mainline operations. In the final five days of the month, Continental maintained an on-time arrival rate of 90.3 percent with an average load factor of 85.5 percent and no flight cancellations. In total, the airline operated 13 days without a single flight cancellation, including the day when hurricane Claudette passed within 90 miles of Continental's Houston hub at Bush Intercontinental Airport. In July 2003, Continental flew 6.0 billion mainline revenue passenger miles (RPMs) and 7.1 billion mainline available seat miles (ASMs) systemwide, resulting in a traffic increase of 5.6 percent and a capacity decrease of 0.7 percent as compared to July 2002. Domestic mainline traffic was 3.7 billion RPMs in July 2003, up 9.3 percent from July 2002, and July 2003 domestic mainline capacity was 4.3 billion ASMs, up 1.0 percent from July 2002. Systemwide July 2003 mainline passenger revenue per available seat mile (RASM) is estimated to have increased between 4 and 6 percent compared to July 2002. For June 2003, RASM increased 0.4 percent as compared to June 2002. Continental's regional operations (Continental Express) set an all time load factor record of 74.4 percent in July 2003, 7.0 points above last year's July load factor and 0.9 points above the previous record set last month. Regional RPMs were 585.5 million and regional ASMs were 787.2 million in July 2003, resulting in a traffic increase of 61.4 percent and a capacity increase of 46.2 percent versus July 2002. This press release contains forward-looking statements that are not limited to historical facts, but reflect the company's current beliefs, expectations or intentions regarding future events. All forward-looking statements involve risks and uncertainties that could cause actual results to differ materially from those in the forward-looking statements. For examples of such risks and uncertainties, please see the risk factors set forth in the company's 2002 10-K and its other securities filings, which identify important matters such as terrorist attacks, domestic and international economic conditions, the significant cost of aircraft fuel, labor costs, competition, regulatory matters and industry conditions, including the demand for air travel, the airline pricing environment and industry capacity decisions. The company undertakes no obligation to publicly update or revise any forward- looking statements to reflect events or circumstances that may arise after the date of this press release. customers using the system to complete their reconfirmation. deployment, Continental has already achieved a 100% ROI in the three months,"
Continental. "Continental's call centers handle over 40 million calls a year. regardless of how much information the traveler has on hand. single response or adjusting to unexpected information provided by the caller. effectiveness of a human being. delivering immediate value and cost-savings to our clients." technology and are very pleased with the initial results." dividends for our valued customers," said Continental's Hand. automated -- that are totally dedicated to customer service and nothing less,"
continues to deliver on its brand promise of excellent service." sales, and handle unplanned call volumes without hiring additional staff. Voxify was founded by MIT technologists and enterprise software veterans.